by Dave from The Longest Way Home ~ July 12th, 2017. Updated on July 23rd, 2017. Published in: Travel blog » Nepal. This is about where to find the best coffee beans, roasters and brands in Nepal. For getting a great cup of coffee read my review of coffee shops in Nepal. I’ve spent a lot of time in coffee shops throughout Nepal and by making my own coffee with Nepali beans. Over the past ten years coffee brands have grown from about 3 to over a dozen. I write a “dozen” with a little care as many are fly-by-nights who disappear after a year of business. So I’m not including them in my review here. Many of these “start ups” buy old beans and repackage them or simply keep splitting up their companies thusly renaming them. So, I’m seriously not interested in them, no matter how much they claim “importance”. The coffee bean companies reviewed here have either been around a few years, are of exceptional quality or deserve to be avoided! For all the coffee bean and roaster reviews here, I bought the beans myself, either directly from the roaster or from the supplier directly. I’ve also bought some from Nepali supermarkets and coffee shops. I grind the coffee beans myself and usually make an espresso or Americano with them. I’m making coffee in this manner so there will be a consistent grind and brew so every bean/cup can be reviewed equally. Before we even get started, let me say that I disregard anything to do with “organic” in Nepal. It’s a catchphrase that started around 2010 to reel tourists in. There is no real “organic” monitoring in Nepal that is consistent nor regulated properly. This is a fact and a bit of a joke whenever mentioned among locals. So let’s move on. There’s one more point to make when it comes to coffee producers in Nepal. Everybody has an excuse as to why something is not good. This is the Nepali way, unfortunately. 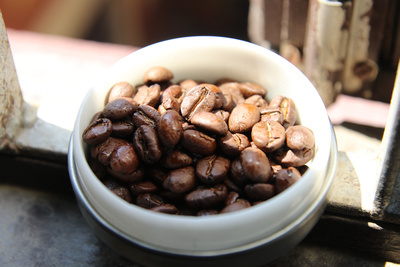 Nepal’s got a thing for dark roasted coffee beans … sometimes they should medium it up! “You are using too much bean!”. “This is dark roast, better to try medium roast”. The answer to this is that they (mostly) don’t have any medium roast in stock. Soooo…. Tastes exactly the same because … well it’s not really organic. I’ve really had enough of Nepali coffee roasters excuses. The biggest issue with all coffee beans in Nepal is the roasting process. Very few people actually know about it. Fewer still get it right consistently. The latter word is perhaps the most important. Hence this is the most likely reason the vast majority of Nepali coffee is “dark roast”. I’ve conversed with some of these “roasters” myself and have asked for medium roast, only to get dark with vague blank expressions. Likewise house blends or craft coffee roasts are inconsistent and random at best. Most Nepali roasters are more concerned with staff measuring beans out to the milligram for packaging than in getting the best roast or flavor from the bean. Arabica beans are grown in Nepal. Over 70% of the world’s coffee is Arabica. It’s known to withstand low temperatures and can grow at altitude. So it is well suited to Nepal. 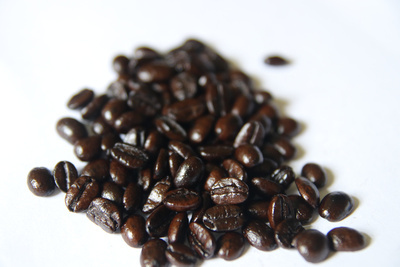 Arabica is a dark nutty bean which leads one to understanding the type of flavor you can expect in Nepal’s Arabica. However it is not meant to be acidic. In Ethiopia, South America and Indonesia the arabica bean is not acidic, yet in Nepal many roasts turn out to be this way. My only conclusion to this is that Nepal has not yet developed suitable roasting techniques nor are they consistent in maintaining good staff. Very little attention is also paid to quality coffee plant growing, roasting, storing or packing. Hopefully this will change over the years as a few companies are becoming more consistent. With all this being said, there are some great coffee beans out there for people wanting to brew their own or send some home. Nepal coffee beans are not cheap to buy. The better roasts are indeed expensive and the quality is offten not always on par with roasts you will find in export coffee shops. 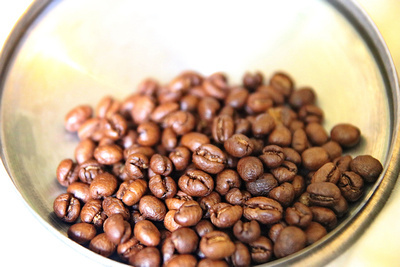 1 kilo of coffee beans can cost over USD$22 in Nepal. A mere 250 gram packet of coffee beans in Nepal can cost USD$8. So no, Nepal coffee beans are expensive if you plan to export them. It’s one of the reasons I’ve written this review. 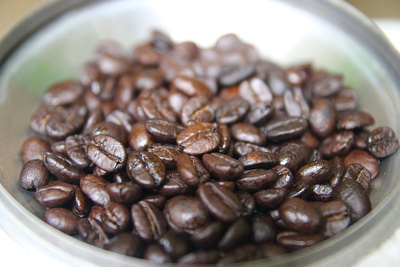 Coffee beans in Nepal are still quite expensive compared to South American or African beans. Why are Nepal coffee beans so expensive? There are many reasons. Firstly, the industry is very new in terms of coffee plantations. The trees are still growing and there’s a shortage of supply for the domestic market. Secondly, the domestic market, while growing rapidly, is not as lucrative as the export market. A savvy business person could certainly work out a good export deal. However for the tourist it’s profoundly cheaper to sample Nepali coffee in one of the coffee shops around Nepal. For expats or those staying for some time in Nepal this review of the best coffee roasters and beans in Nepal will help you get the best coffee experience. Again, all beans here were bought from source soon after roasting, self ground and made into both espressos and Americanos. An equal brewing method so all beans get a fair review. Beans are rated out of 5. Presented in a nice golden foil wrapper the beans smell excellent. They are a little dark looking when opened though. My first tasting instantly confirmed that these beans are quite bitter and very acidic. There’s a chemical overture here. At first I thought I might have bought a bad batch. But a few weeks later I had another at a coffee shop serving Everest Coffee and it was just as bad. Sorry, Everest Coffee but you are ranking the lowest. Foil packaging with the airhole to smell the beans very low making it hard to smell until you open them. There’s nothing so great about the smell of the beans but the coffee beans themselves are all uniform in size, shape and color. This was one of the better coffee beans I’ve tasted. Nutty and fresh tasting. There is very little bitterness with HimCafe which is really good for a bean roasted in Nepal. Certainly one of the better blends. Mountain Coffee Beans – not bad, but will they be around next year? One of the few offering a mid roast. The beans are not always consistent. Some look to be dark while others mid roasted. The taste is woody with little acidity. But largely quite mild. My biggest concern with Mountain Coffee Beans was the lack of manufacturing dates or best before dates on their packaging. I went to their own coffee shop and found a similar taste in the coffee. Nepal Organic Coffee – super dark beans, but also quite good! They state they’ve been roasting coffee since 1989 so hopefully the beans are up to scratch. Again, this is a dark roasted coffee with even color throughout all the beans. They smell over roasted and bitter. However, the coffee flavor is dark, earthy and quite good. My biggest concern is the freshness of the bean. There was very little crema and indeed it was hard to make the crema – a sure sign the bean is not so freshly roasted even though the packaging stated it was manufactured in the same month. I have my doubts. All in all the strong flavor of Nepal Organic Coffee is quite good. Here’s an interesting Coffee bean from the Chikusa Cafe. One of Nepal’s very few actual craft coffee shops. They get their own beans independently and blend the beans into one of the best tasting coffees I’ve come across. The beans come from a local supplier and Chikusa blend them themselves. The result is a very strong rustic and nutty wood like flavor unlike any other I’ve come across. 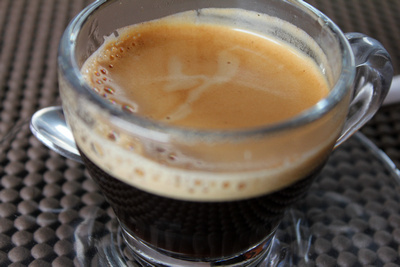 They make for an excellent Americano and one of the most flavorsome espressos you’ll ever find. One thing though. Chikusa use a cloth filter method when brewing their own coffees. When you brew at home there is a slight difference in the quality. Perhaps investing in a cloth rag would be worth it if brewing at home! Rated: 5/5 for house coffee and 4/5 for the beans. One of Nepal’s oldest and best known coffee roasters and shops offer a series of blends only available from their shops. I found the coffee to be rather bland. It’s certainly not bad but also didn’t seem overly great either. I was also a little disappointed with their staffs lack of knowledge about what beans they had on offer. It seems their mountain and house blends are one in the same yet highly priced. It’s certainly worth going to one of their coffee shops to try the beans out, however the staff can only offer dark or medium roasts which is also a little strange considering they are selling about 5 different types of freshly roasted bean! A unique coffee being grown in Dhading and roasted in Kathmandu. The beans are well formed and have a consistent look throughout. They don’t smell particularly strong nor does the coffee produce a good crema. However the taste is surprisingly excellent. There’s a strong old wood smoke flavor mixed with a mild fruitiness which is very pleasant. It’s also one of the few coffees that leaves a lovely aftertaste. The only problem with Buddha Organic coffee is that it seems quite hard to find in any stores. I hope this changes as it’s a unique roast with a lot of potential – sadly they have issues with delivery too it seems! They no longer roast their own coffee which is a terrible shame as it would have come out as the best. The owner used to bring fresh beans from the West of Pokhara and roasted them on his small Korean roaster at his pizza store. It was what I dubbed “Liquid Gold”. If they start making freshly roasted coffee again, do try some. Grown and roasted by Plantec Coffee estate who have a plantation just outside the Kathmandu Valley. I found the beans to be well selected with an even color throughout. The beans have a mild smell to them which is not overpowering. The coffee taste is quite excellent bearing a fruity and nutty quality unlike many other roasts. It was also one of the few roasts that instantly tasted fresh and similar to an Italian roast you might find in any export section. It’s certainly encouraging to come across Jalpa Gold and certainly worth checking out if you want to bring some ready roasted coffee home from Nepal. Another bean grown and roasted by Plantec Coffee Estate in Nuwakot. They say this is their best “export quality” brand. I was rather skeptical of the claims that the beans were sun roasted and picked by hand. The aroma of the bean was relatively mild much like the Jalpa beans so with all due skepticism I was surprised at how good the coffee was. It’s great to discover that some coffee roasters in Nepal are even producing peaberry coffee. The small beans known as peaberry or caracolillo (snails in Spanish) are hand-selected from normal beans prior to the roasting process. These small beans make up about 5% of coffee plants produce and are formed as smaller fruits compared to the regular flat fruit or bean. It’s generally more expensive due to the hand picking needed. The roast is said to be more even. The peaberry from Newa Estare is a refreshing mid-roast that’s by far the sweetest of beans I’ve found in Nepal. The beans also produce a nice little healthy gold crema. 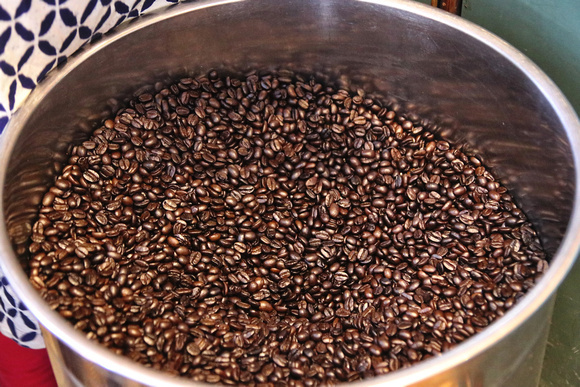 This peaberry roast would do nicely as an after lunch or dinner coffee or post-desert coffee. It’s another export quality bean. Another new and very excellent coffee in Nepal. I discovered this one on a Kathmandu to Pokhara bus stop which had their Star Coffee shop servicing amazing espresso. The coffee is grown in Dhampus and roasted in a small Japanese roaster in Pokhara. The result? A dynamic ever so rich dark chocolate, woody, nutty cacophony of pleasure and wonderfully flavorful. They are one of the few roasters that can make a mid-dark roast. Only their Pokhara outlet sells the beans as the rest are only made for the Japanese export market. Those who didn’t make the list. Newa Estate (Peaberry) this roast should be on the list. It narrowly misses out only because I’m not overly keen on sweet coffee. That said, if you are then it certainly could come in at number 3 on the list. Himalayan Java – one of the oldest and best known coffee roasters in Nepal, they didn’t quite make the list due to a rather bland flavor. Nepal Organic Coffee is quite good, however I do feel the beans have been over-roasted – certainly worth a try. Everest Coffee Beans – sorry, but they really are not good. 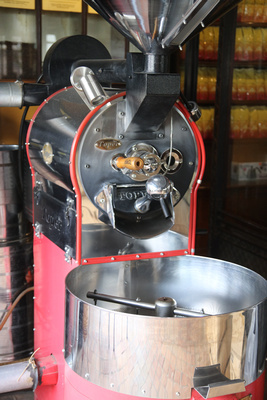 Pokhara Pizza House (Craft Coffee) no longer roasting. Machapuchare Coffee is a leading brand from west Nepal however I find it nearly impossible to find aside from a few coffee shops – it doesn’t make the list based on this though it would be a number 5 contender. This coffee ranking list will be kept updated. So if anything new comes on the scene do let me know. Meanwhile if you’d like to know where you can sit down for a good coffee check out my article on the best coffee shops in Nepal. The most up-to-date, popular and dedicated guidebook to Nepal in the world. Over 550 pages & 900+ photographs of every temple listed, every day on all the treks lists and so much more. I’m a big supporter of craft coffee. Even if they just blend the beans and don’t roast them. Roasting and growing takes a lot of time and money. Not possible for everyone. But with a good sense of taste and smell small business can do well. Very much agreed. Craft coffee is every bit if not better than large coffee corporations. Great to see it in Nepal too! Wow, I never knew Nepal has so much coffee. Looks amazing. It can be really good! Nice to know this about Nepal. I like Colombian mid roasts! Love coffee. I’m going to try my local market to see if I can find any Nepali coffee after reading this!!! Might be hard to get! Coffee drinkers unite! I never knew that Nepal great coffee. Fascinating. How does it compare to Indonesian? I found Indonesian to also be quite dark and strong. Nepali coffee is a little more nutty. Strange how nobody can get a consistent roast in Nepal. I know it’s tricky at the start, but surely not that hard!! Sadly, Nepal is still struggling with consistencies across many foods and drink items made in the country. I never thought Nepal coffee would be that expensive! It’s crazy. Indeed. It’s a shame. Aside from in country costs, export costs are sky high! Do the coffee shops tell you what beans they are using? Or do you have to ask? You have to ask. Most will tell you with no issue. Like many of the others, I never knew about Nepali coffee. Sounds wonderful. But seems impossible to find anywhere! Due to costs it’s difficult to find outside Nepal.